On June 28, AGSIW hosted a public panel discussion on GCC-Horn of Africa relations. On June 28, AGSIW hosted a public panel discussion on GCC-Horn of Africa relations. Part of the Gulf Rising series, speakers explored the regional and domestic issues that have defined the Gulf states’ foreign policy choices toward Horn of Africa countries and vice versa, as well as the implications for regional stability and U.S. interests. The discussion featured Taimur Khan, non-resident fellow at AGSIW; Annette Weber, senior associate of the Middle East and Africa Research Division at the German Institute for International and Security Studies; and Michael Woldemariam, assistant professor at Boston University. Senior Resident Scholar Hussein Ibish moderated the discussion. As the Gulf Cooperation Council countries have claimed a new regional leadership role over the past decade, their relations with the countries of the Horn of Africa have intensified and gained new strategic significance. The Horn of Africa – and East Africa more broadly – have some of the fastest growing economies on the continent, with emerging middle classes. But the relatively untapped markets are in dire need of investment in infrastructure and the security architecture required to attract them. For their part, the Gulf Arab countries have sought to strengthen their economic ties to Horn of Africa countries through the development and management of ports as well as the establishment of free zones. Discussing economic ties, Michael Woldemariam emphasized the importance of capital from the Gulf, which has proven to be critical in developing ports, and other infrastructure projects in the Horn. Gulf countries have also shown a clear military interest in the region, building bases to ensure strategic depth and provide logistical platforms in support of operations in Yemen, as well as regional counterterrorism and antipiracy operations. Speakers mentioned that the increased interest in the region from the Gulf Arab states has brought its own challenges, with the Horn of Africa being a region with multiple fault lines and security dilemmas, as well as concerns regarding regime survival across multiple countries. 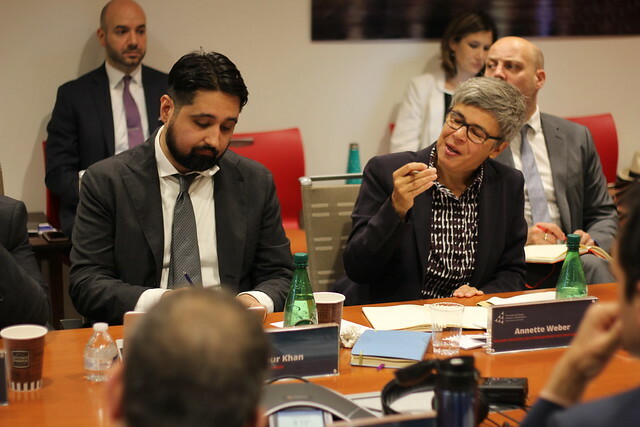 The speakers questioned whether the Gulf Arab states have created a long-term engagement strategy toward the Horn region or are just acting on short term security and economic interests, and whether the interest in the region and engagement will outlast the Gulf states’ intervention in Yemen. Annette Weber added that if there is a collective understanding between the two regions that cooperation can lead to positive outcomes, particularly in conflict mediation. She added that the recent positive changes in the relationship between Ethiopia and Eretria was a result of the United Arab Emirates’ proactive role in resolving the conflict. The panel discussed the role of Turkey, China, the United States, and Iran in the Horn of Africa, mentioning that most Horn countries severed ties with Iran, following the attack on the Saudi embassy in Tehran, in order to maintain strong ties with Saudi Arabia and the UAE. Both Weber and Woldemariam mentioned Turkey’s engagement in long-term strategies in the region with a desire to project power. The panel closed with a question and answer portion from the audience. AGSIW’s Gulf Rising series analyzes the energized role of the Gulf Arab states in the international system, looking beyond GCC relations with the United States to examine ties with other key countries and regions. Additionally, it investigates motivations behind Gulf Arab states’ foreign policy choices and evaluates the implications for U.S. foreign policy toward the GCC states and the region.